More of your favorite games arrived this week. New from WizKids is Favelas a clever tile placement, dice manipulation game that requires a little luck and plenty of tactical decisions. 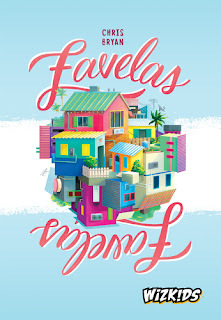 Players will develop their own colorful Favelas neighborhood of Rio de Janeiro. Each player has a board with brightly colored housing spaces. Turns consist of taking a single or double Favela tile, placing it on your board, and adjusting the corresponding colored scoring die for each color you matched with your newly placed tile. Play continues until the End Of Year tile is revealed which triggers the first scoring. Each color is scored based on who has the majority of that color. The value on each of the scoring dice will determine the point value awarded. 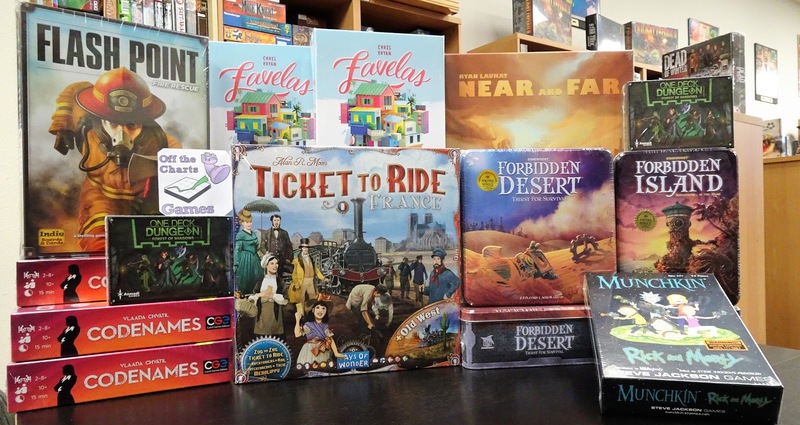 The next round begins with re-rolling the scoring dice and using the 2nd year stack of tiles. Player boards remain unchanged from the previous year. Play continues in the same manner until the end of year 3. The player with the most points wins. 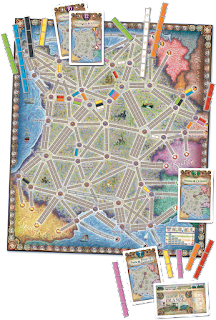 Days of Wonder has released another in the Ticket To Ride Map Collection Series. This latest expansion, Ticket To Ride France contains a double-sided game board with a map of France on one side and and a map of the Old West on the flip side. 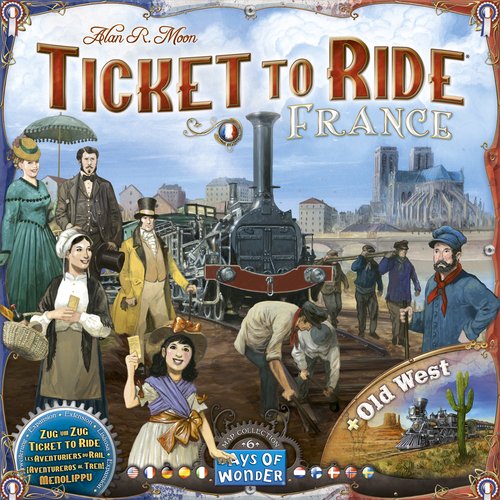 This is an expansion and requires either Ticket To Ride or Ticket To Ride Europe from which you borrow the trains and the train car cards to use for the France and the Old West games. 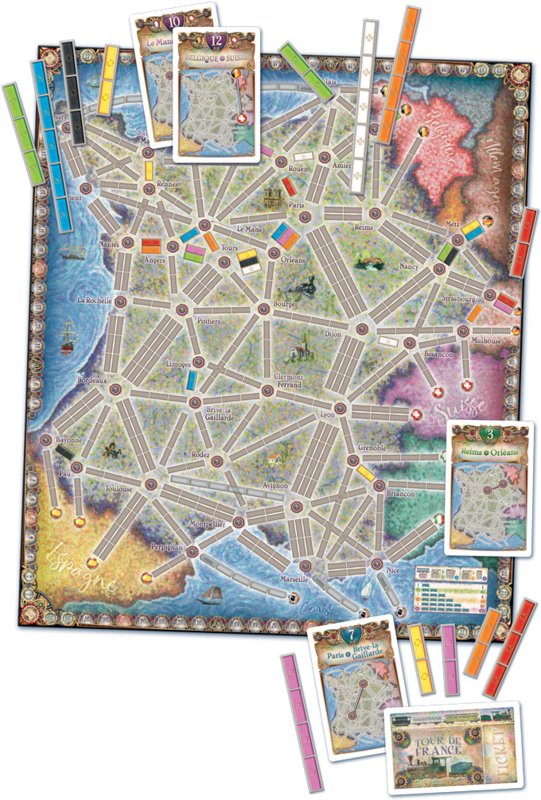 The French map side is designed for 2 to 5 players and includes destination tickets, and color track pieces. It is pretty much a blank canvas where most of the routes are in fact Track Beds and cannot be claimed at the beginning of the game. They must first be built. 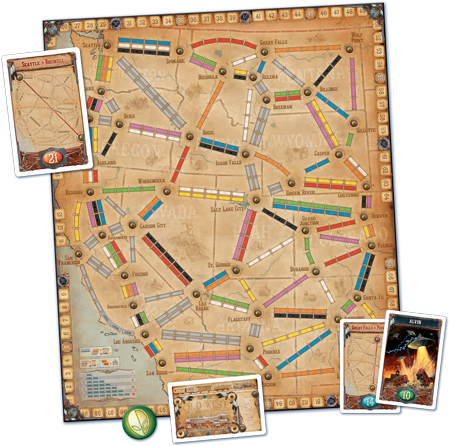 When taking the Draw Train Car cards action you will also place a colored Track Section piece on the board. This route is now available for anyone to claim with the corresponding train cards. When claiming the route your trains will replace the Track Section which will go back to the supply for future use. Additionally, some of the routes are special ferry routes. In order to claim these routes one of your train track cards must be a locomotive card. The Old West map side is designed for 2 to 6 players and includes destination tickets, white train cars, city markers, and Alvin the Alien marker. Players develop their networks starting from their home cities and every subsequent route must connect back to their home city. When claiming a route a player may also pay the cost to place one of their city markers on either city of this route. Thereafter, you will receive the points for any claimed route to that city. Additionally, some of the routes are special ferry routes. In order to claim these routes one of your train track cards must be a locomotive card. Alvin the Alien is a variant that starts in Roswell. Control Alvin and gain bonus points. 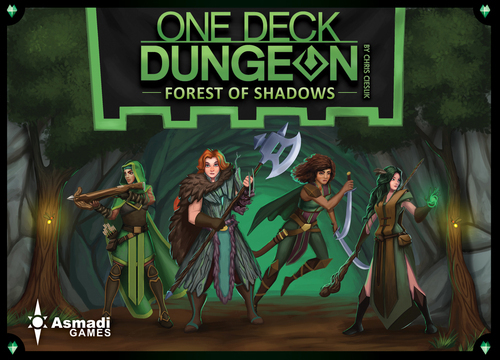 One Deck Dungeon: Forest of Shadows is a 2-player cooperative dungeon delve. 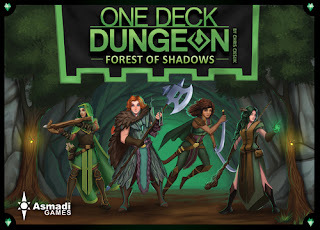 This can be played as a stand-alone game or combined with One Deck Dungeon as an expansion and even taking it to 4 players. Forest of Shadows adds all new heroes, dungeons, foes, perils, and makes your adventures more dangerous with a new type of damage: poison. You'll have to weigh spending time tending to your wounds against the ever-pressing need to battle and find loot.